How much does it cost to travel to Copenhagen? How much money will you need in Copenhagen? kr1,186 ($179) is the average daily price for traveling in Copenhagen. The average price of food for one day is kr359 ($54). The average price of a hotel for a couple is kr1,015 ($153). Additional pricing is in the table below. These average travel prices have been collected from other travelers to help you plan your own travel budget. How much money do I need for Copenhagen? 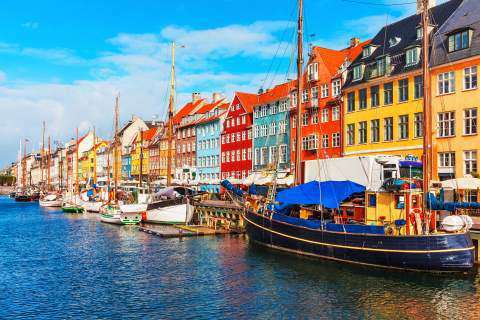 Copenhagen is the capital city of Denmark. It has a small town vibe but is still a cosmopolitan city with lots of shopping, culture, and nightlife. It's a very safe and comfortable city that is easy to explore on foot. Copenhagen is the birthplace of many old fairytales, but also has modern, world class architecture and a liberal vibe. The people of Copenhagen are diverse and international. Most residents are Danes, but some come from Germany and Sweden and there are also many Middle Eastern immigrants. Copenhagen, like much of the region, has four separate seasons. Most people prefer to visit between May and late August when the weather is warm. Temperatures average around 20 degrees Celsius and the daylight hours are long. If you get too warm, there are several free pools in the harbour waters near the center of town. There are also a lot of festivals during the months of June and July, so this is a great time to be in town. Spring is more unpredictable, but can be a wonderful time to explore the city as the crowds are less and the weather is often quite nice. Check out the Cherry Blossoms in Copenhagen in Spring if you're visiting at this time of year, too. Once the weather warms up, people flock outside and fill the cafes and streets. It's a great time to seem the city at its best. During the fall months, the weather turns cold again and many Danes stay in, socializing with friends and family in the comfort of their own home. The days are short and the temperature drops. By winter, it is very cold, but there are Christmas decorations that light up the city. Christmas markets are spread throughout the city and there is a lot to see and do. Sights and attractions in Copenhagen include art galleries, museums, architecture, and monuments. Museums are often open free of charge on Wednesdays. Copenhagen is also famous for its design and style. You can learn more about this at the Danish Design Center in Indre By. Also check out Forside: Design Museum Denmark (formerly known as Kunstindustrimuseet) which has an interesting collection of work. Royal Copenhagen also has a display of porcelain from that is quite historic. If you're interested in modern glass art go to Cisterne on Frederiksberg. Indre By is the Medieval City or Centrum. This part of town is called many different things, but it is the historical center of Copenhagen. There you will find many of the most notable churches, historic buildings, and some great shopping. Christianshavn is a trendy area that has many canals. Vesterbro is a lively area with a lot to do. There are many cafes and bars near the main streets. Frederiksberg is still technically its own municipality, but it is completely surrounded by Copenhagen. Norrebro has a working class feel with a lot of students and a large immigrant population. Osterbro is where you will find the famous Little Mermaid Statue and the Kastellet Citadel. Amager is an island that has the Kastrup Airport. There are many yearly events in Copenhagen. Some of the most popular include the Crafts Fair in August, Copenhagen Fashion Week in February, International Workers Day in May, CPH Distortion, Zulu Sommerbio, Copenhagen Jazzfestival, Gron Koncert, and many, many more. Eating out in Copenhagen is generally expensive but there are some budget friendly options available. Most of the cheapest options are shawarma and pizza places that are spread throughout the city. The most affordable options are around Istedgade on Vesterbro and Norrebrogade on Norrebro. Another option is to try the Mediterranean style all you can eat buffets in the inner city. If you're looking for a traditional Danish experience make sure you try a polsevogn. This "sausage wagon" offers a variety of hot dogs with several toppings to choose from. These are also great places to socialize and meet some locals. There are two main transportation hubs in Copenhagen. Central Station has S-trains, intercity trains, and buses. Norreport Station has S-trains, metro, regional trains and buses. The public transportation runs on a zone system. You can buy a two-zone ticket that lets you travel between two zones for one hour by trains, metro and buses. S-trains are comparable to the German S-Bahn. In the outer parts of the city, trains run roughly every 10 minutes but closer in they run every few minutes. The metro runs from Vanlose through the city center and then splits with one line running to the new town of Orestad and the other going to the airport. Trains run at roughly an every four minute interval. For shorter distances, most locals take bicycles, but there is also a bus network. The system can be complicated and there are several types of buses including regular buses, A buses which stop frequently, and S buses, that are long express buses with few stops. These buses usually go far into the suburbs. The 11A line is specifically for sightseeing. It travels along a circle around the inner city and stops at the main sights. The buses run every seven minutes and you can wave them down as they pass. The city of Copenhagen is well known for its design and architecture. If you're in Copenhagen head to the downtown area to visit the Danish Design Center. Also head to the nearby Kunstindustrimuseet which has some great examples of Danish Design on display. There's also a museum in Royal Copenhagen that has some great porcelain pieces on display.